The testing methods covered in this Guide include those applicable to: (1) The measurement of the resistance and impedance to earth of electrodes varying from small rods and plates to large grounding sys- 4 QJ terns of stations. (2) Ground potential surveys, including the measurement of step and touch voltages, and potential contour surveys. (3) Scale-model tests for laboratory determination of the ground resistance and potential gradients for an idealized design. (4) The measurement of earth resistivity. 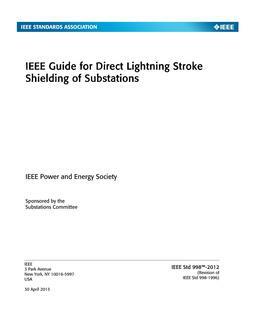 2.02 The methods covered herein are generally limited to those using direct current or periodically reversed direct current, or commercial power frequencies. This Guide does not claim to cover all possible methods, even within these limitations. 2.03 Extreme precision is seldom possible because of the many variables encountered; therefore, the measurements should be carefully made by the most suitable method available, with a thorough understanding of the possible sources of error. 2.04 Definitions of terms pertinent to the subject matter are given, with references to their sources where known. Those approved or standardized by other bodies are used wherever possible. It is the purpose of this Guide to describe and discuss the present state of the technique of measuring ground resistance and impedance, earth resistivity, and potential gradients resulting from currents in the earth and the prediction of the magnitudes of ground resistance and potential gradients from scale model tests.1 Factors governing the choice of instruments and the techniques for various types of work are covered, such as the purpose of the measurement, the accuracy required, the time and instruments available, and the nature of the ground or grounding system under test.